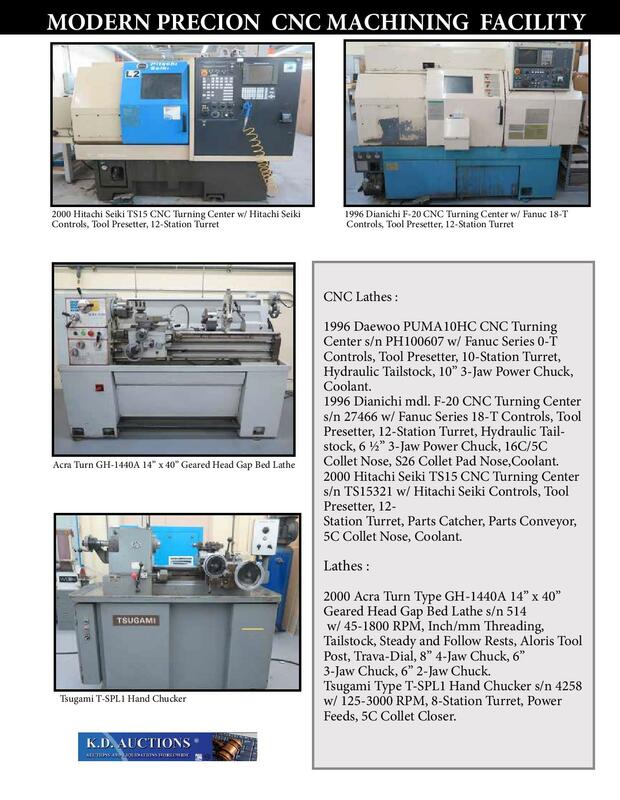 FEATURING: CNC Lathes : 1996 Daewoo PUMA10HC CNC Turning Center s/n PH100607 w/ Fanuc Series 0-T Controls, Tool Presetter, 10-Station Turret, Hydraulic Tailstock, 10” 3-Jaw Power Chuck, Coolant. 1996 Dianichi mdl. 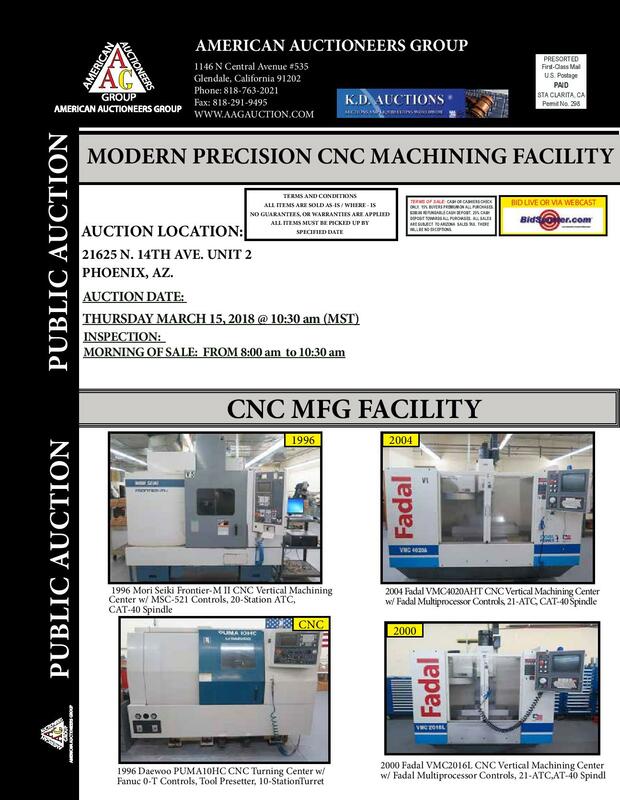 F-20 CNC Turning Center s/n 27466 w/ Fanuc Series 18-T Controls, Tool Presetter, 12-Station Turret, Hydraulic Tailstock, 6 ½” 3-Jaw Power Chuck, 16C/5C Collet Nose, S26 Collet Pad Nose,Coolant. 2000 Hitachi Seiki TS15 CNC Turning Center s/n TS15321 w/ Hitachi Seiki Controls, Tool Presetter, 12- Station Turret, Parts Catcher, Parts Conveyor, 5C Collet Nose, Coolant. Lathes : 2000 Acra Turn Type GH-1440A 14” x 40” Geared Head Gap Bed Lathe s/n 514 w/ 45-1800 RPM, Inch/mm Threading, Tailstock, Steady and Follow Rests, Aloris Tool Post, Trava-Dial, 8” 4-Jaw Chuck, 6” 3-Jaw Chuck, 6” 2-Jaw Chuck. Tsugami Type T-SPL1 Hand Chucker s/n 4258 w/ 125-3000 RPM, 8-Station Turret, Power Feeds, 5C Collet Closer.Support Machinery : Continental mdl. 100M 10” Horizontal Band Saw w/ 4-Speeds, Manual Clamping, Coolant, Roll Base. Startrite 24-V- 10 24” Vertical Band Saw s/n 64234M w/ Blade Welder, 20-3840 FPM, 19” x 19” Table. Harig “Super 612” 6” x 12” Surface Grinder w/ Walker Magnetic Chuck. Baldor 3/4Hp Pedestal Buffer. Wilton mdl. 4210 6” Belt / 10” Disc Sander s/n 06120059 w/ Stand. Dayton mdl. 1PEJ6 Wall Mounted Dust Collector. Central Hydraulics 20 Ton Hydraulic H-Frame Press. Benchmaster mdl. 2 Arbor Press. Eaton mdl. EC-SRW3- 30HP-DV 30Hp Rotary Screw Air Compressor s/n EC-SRW- 090111R w/ Eaton Digital Controls, 123 CFM @ 120-145 PSIG, 21,711 Metered Hours. SpeedAire mdl. 1ZPU8 Refrigerated Air Dryer. Tooling : Haas 4 th Axis 8” Rotary Head w/ Haas Servo Controller. (2) Haas 4 th Axis 5C Rotary Heads w/ Haas Servo Controllers. (210) CAT-40 Taper Tooling. Big Bear 40-Taper Tooling Cart. (8) Kurt 6” Angle-Lock Vises. 8” Universal Vise. Yuasa 14” Rotary Table. Suburban MG-5CV- S1 Precision Rotary Fixture. Narex Boring / Facing Head w/ R8 Shank. Suburban 6” x 6” Sine Table. 5C Indexing Heads and Spin Fixture. (250) 5C Collets. Angle Plates, V-Blocks, 2-4- 6 and 1-2- 3 Blocks. 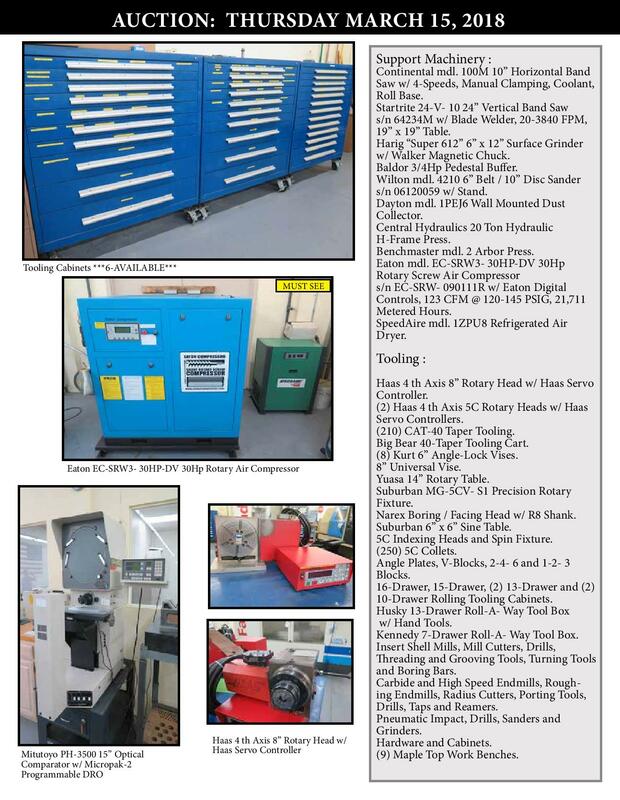 16-Drawer, 15-Drawer, (2) 13-Drawer and (2) 10-Drawer Rolling Tooling Cabinets. Husky 13-Drawer Roll-A- Way Tool Box w/ Hand Tools. Kennedy 7-Drawer Roll-A- Way Tool Box. Insert Shell Mills, Mill Cutters, Drills, Threading and Grooving Tools, Turning Tools and Boring Bars. Carbide and High Speed Endmills, Roughing Endmills, Radius Cutters, Porting Tools, Drills, Taps and Reamers. Pneumatic Impact, Drills, Sanders and Grinders. Hardware and Cabinets. (9) Maple Top Work Benches.Inspection : Mitutoyo PH-3500 15” Optical Comparator s/n 760206 w/ Mitutoyo Micropak-2 Programmable DRO,Digital Angular Readout, Surface and Profile Illumination, 10X and 20X Lenses, Stand. Mitutoyo 13” Height Master. Fowler 24” Digital Height Gage. Mitutoyo and Import 24” Dial Height Gages. Mitutoyo 12” Vernier Height Gage. Mitutoyo, Brown & Sharp and Import Gage Block Sets. Mitutoyo and Starrett Digital Indicators w/ Sony Height Stands. Mueller Dial Groove Gages. Mitutoyo Bore Mic Set .8”-1.0”, 1.0”-1.2”, 1.2”- 1.6”, 1.6”-2.0”. Etalon Bore Mic Set .4”-.5”, .5”-.65”, .6”-.7”, .7”-.8”. Fowler Dial Bore Gages .4”-.7”, .7”-1.4”, 1.4”-6”, 4”-6.5”. Mitutoyo 1.475”-2.075” Dial Bore Gage. Diatest Dial Bore Gage Sets. Mitutoyo 24”-30”, 18”-24”, 12”-18” OD Mics. Mitutoyo and Import 0-6” OD Mic Sets. Mitutoyo 1”-2”, 0-1” Digital OD Mics. Mitutoyo OD Mics. Mitutoyo and Eaton 1”-2”, 0-1” Indicating OD Mics. Mitutoyo 1”-2”, 0-1” Thread Pitch Mics. Mitutoyo and Starrett Blade Mics to 5”. Mitutoyo and Starrett Spline Mics. Starrett 12”-110” Dial ID Mic. Mitutoyo 8”-40” ID Mic. Mitutoyo and Starrett 0-6” Depth Mics. SPI Dial Chamfer Gage. Mitutoyo and Import 40” Vernier Calipers. Starrett and Kanon 12” Vernier Calipers. Thread Ring and Plug Gages. Meyer Pin Gage Cabinet .061”-.750”. Deltronic Gage Pin Sets. Pin Gage Sets .011”-1.000”. 36” x 48” x 4 ½” Granite Surface Plate w/ Roll Stand. 30” x 47” x 5” Granite Surface Plate w/ Roll Stand. 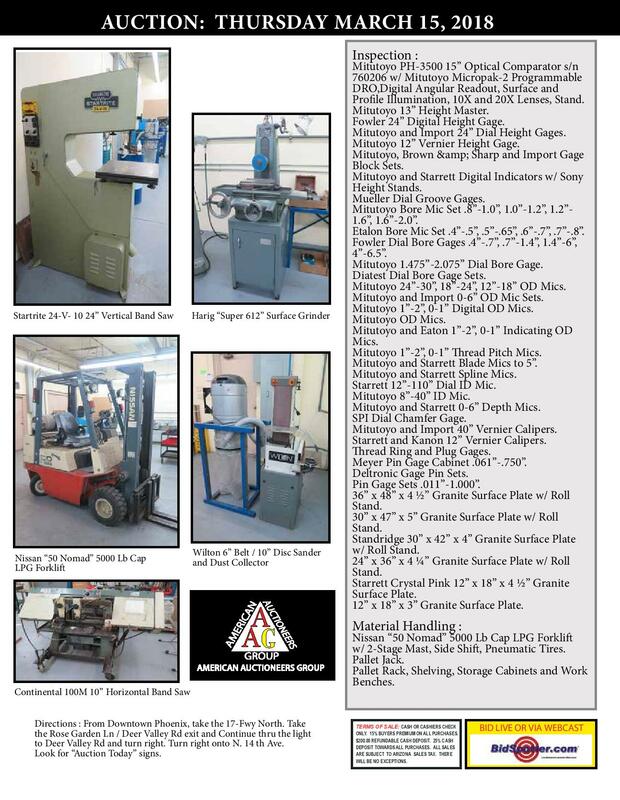 Standridge 30” x 42” x 4” Granite Surface Plate w/ Roll Stand. 24” x 36” x 4 ¼” Granite Surface Plate w/ Roll Stand. Starrett Crystal Pink 12” x 18” x 4 ½” Granite Surface Plate. 12” x 18” x 3” Granite Surface Plate. Material Handling : Nissan “50 Nomad” 5000 Lb Cap LPG Forklift w/ 2-Stage Mast, Side Shift, Pneumatic Tires. Pallet Jack. Pallet Rack, Shelving, Storage Cabinets and Work Benches.